A dramatic finish to the 2016 Bathurst 1000 has seen Will Davison and Jonathon Webb hold off the field by the closest winning margin in history despite having to conserve fuel during the last number of laps despite safety cars. Jamie Whincup, who had the fastest car all weekend and again during the race was actually the first car to cross the finish line, but a controversial penalty he received from a crash in the final ten laps ruled him ineligible to win. With a three-way battle for second place, and Fabian Coulthard desperately trying to extend his lead so he could pit for a splash and dash of fuel to make it home, Whincup went up the inside for Scott McLaughlin at the chase. To his horror though, he nudged McLaughlin off the track and into the grass – Whincup did try to redress the issue and slot in behind McLaughlin who came back onto the track, but Garth Tander behind wasn’t having any of it as he tried to push the pace and make up position. Instead he got tangled with Whincup who didn’t want to push as fast, and then slammed into McLaughlin and the pair both went into the outside fence on the run to Murrays corner. It ruled them both out of the race with damage as they returned to the pit and after resuming from the safety car period, with Whincup in the lead it was announced he had received a 15 second time penalty. 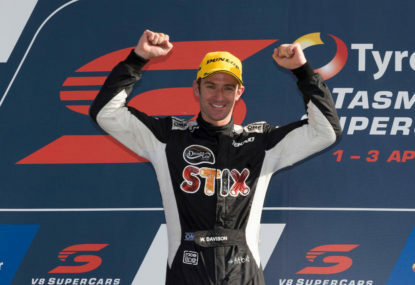 The final laps of the race saw a massive battle between Will Davison and Shane Van Gisbergen, who was racing with Frenchman Alexandre Premat. Despite multiple attempts to pass in a four lap dash to the line after Rick Kelly hit the wall at Forest Elbow, triggering yet another safety car, Van Gisbergen couldn’t get the job done and Davison crossed the line with a car that was out of fuel and just half a length ahead of Van Gisbergen. Nick Percat who seemed to struggle for pace during the closing of the race managed to hang on and take the final spot on the podium, while Whincup would drop to 11th. Earlier, the strategy game played out in a big way over the last 60 laps with Whincup and Davison seemingly on a different strategy to everyone else. After no safety car for an incredible 95 lap period to start the race, which had many on social media wondering what the point of going through the motions for 1000 kilometres was, the race began to hot up. At one point, Jamie Whincup broke the lap record four times in a stint as he tried to open the game allowing for an extra pit stop. However, just as he was preparing to come into the pit lane for the stop to top up fuel and get new tyres Mark Winterbottom had a brake failure and ended up off the road at the chase, being bogged and triggering a safety car. That put everybody on the same strategy for the final 25 laps after they pitted, apart from Fabian Coulthard and Scott McLaughlin who stayed out. In the end, though, an incredible performance from Will Davison to hang on for the victory, along with Jonathon Webb who drove the wheels off the car all day in another amazing edition of the Bathurst 1000.